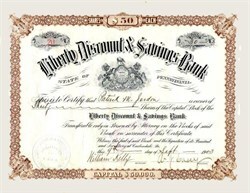 Beautiful certificate from the Liberty Discount & Savings Bank issued in 1903. 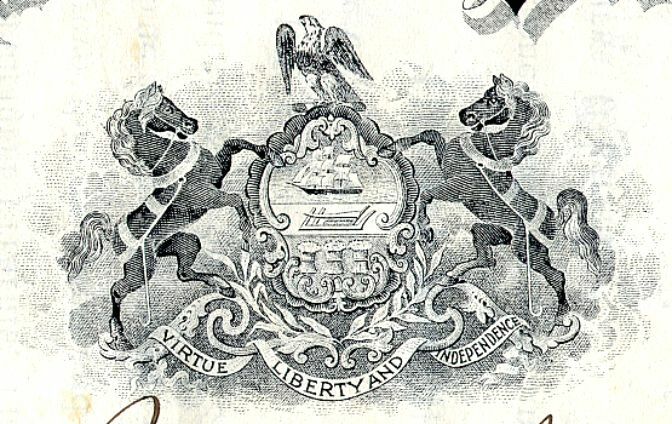 This historic document has an ornate border around it with a vignette of the company's logo with the saying: Virtue, Liberty and Independence. This item has been hand signed by the Company’s President, Andrew J. Casey , and Secretary, William Kelly, and is over 109 years old. The Hotel Casey was a famous hotel located in Scranton, Pennsylvania. Built in 1909 and demolished in 2001, the hotel stood for over 90 years. The hotel was built by Patrick J. and Andrew J. Casey (both successful brewers and bankers) for approximately $1,000,000. Construction began in 1909 and was completed in 1910. Charles R. Weatherhogg of Fort Wayne, Indiana, was the architect. The hotel formally opened on January 21, 1911. At the time it was the largest hotel in northeastern Pennsylvania with eleven stories and 250 rooms. It was considered a landmark of the city of Scranton and one of the top hotels in the Northeastern United States. The former site of the hotel now houses a parking garage and restaurant. Brothers A.J. and P.J. Casey purchased a plot of land on Nov. 11, 1893, at the northwest corner of Lackawanna and Adams avenues. The home of George W. Scranton had stood on the site, perched on a knoll some 12 or 15 feet above street level. But Mr. Scranton had built in another era - a pioneer era that transformed the wilderness into an industrial city. The Casey brothers were about to erect a structure that would take its place as a landmark in that industrial city. Theirs is an immigrant success story. Andrew J. Casey arrived in Scranton from Ireland in 1872. His brothers, Lawrence and Timothy, were already here and had established a wholesale liquor business on Penn Avenue. Within a few years, both brothers had died, leaving Andrew the sole proprietor. In 1887, his younger brother, Patrick, joined him, and in 1890, the Casey brothers moved their business to Lackawanna Avenue. By this time, they had become one of the largest wholesale distributors in the area, carrying whiskeys, wines, cordials, clarets, bitters and, of course, beer. Among others, they sold Bass Ale, a British import, and Burke's Guinness Stout. The Guinness name was famous, but it had no legal standing in America. Arthur Guinness had established his Irish brewery in 1759, but while names were carefully protected in other countries, America was not obliged to obey foreign laws. American companies could import beer or wine and sell them under any name they pleased. They could even import products, mix them, and sell them under a name of their own choosing. In 1892, the Casey brothers went into partnership with William Kelly and established their own brewery. Located at Remington Avenue and Locust Street in Scranton's South Side, it was called Casey and Kelly Brewing Co. In 1897, they joined with E. Robinson's Sons to form the Pennsylvania Central Brewing Co.
Like many of the city's entrepreneurs, the Caseys also got into banking. Patrick served as president of Liberty Discount and Savings Bank of Carbondale. Andrew served as president of Merchants and Mechanics Bank of Scranton and on the city planning commission. But it is the establishment of their grand hotel that would make their lasting mark on the city. They broke ground in August 1909. The Casey brothers were on hand to thrust their shovels into the dirt. No ceremony marked the occasion, but reporters were there to capture the details. "We got the pick and the shovel," said P.J. Casey afterward. "We'll mount it and frame it with a dash o' green in the middle for good luck." Once they had broken ground, the brothers returned to their own business day, and the boss on the construction site set the work crew in motion. Frank Carlucci's construction company had the contract. A steam shovel dug the foundation. The hotel opened in January 1911. The evening before, the Casey brothers dined at its restaurant with their families. More than 600 people reserved tables for its opening day. The thoroughly modern hotel stood 11 stories tall, was fireproof, and measured 148 by 128 feet. The Casey brothers built it in the most sumptuous manner, regardless of cost, and its details ranked among the very best hotels of in the largest cities. Managed by Milton W. Roblee, the hotel flourished. The Casey became the place to stay for entertainers, business tycoons and foreign dignitaries. Its reputation lasted for generations. The Hotel Casey helped change the face of a growing Scranton. For many years, this emblem of luxury stood as a proud testament to the prosperity of this city and its business endeavors. CHERYL A. KASHUBA writes on behalf of the Lackawanna Historical Society. She is co-author of the book "Scranton." Contact the writer: localhistory@timesshamrock.com. LIBERTY DISCOUNT AND SAVINGS BANK, No. 67 Salem Avenue, Carbondale, Lackawanna County, At the close of business November 1, 1913.
amount 750 00 OFFICERS AND DIRECTORS. LIABILITIES—Continued. E. M. Clarke, P. J. Moore, J. B. Murrin. Incorporated April 28, 1903, under General Banking Act, approved the 13th day of May, A. D. 1876. History from StockResearch.pro (Professional Old Stock Certificate Research Service).